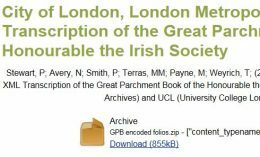 LMA and UCL are pleased to announce that an open access set of 326 XML documents containing encoded transcriptions of the individual folios of the Great Parchment Book is now available via UCL Discovery. The dataset has been made available as a source for the historical and social geographical scholarly community, to allow others to use the dataset for their own research. 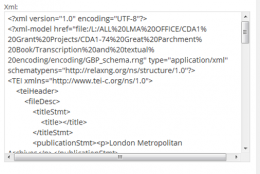 The files include transcription of the folios and XML coding using the Great Parchment Book schema created under the Textual Encoding Initiative (TEI) on oXygen XML Editor Professional software version 14; the data set is 2.56MB in total. The data is provided with a Creative Commons Attribution-non Commercial (CC BY NC 3.0) licence. LMA and UCL would be delighted to be kept informed of how and in what context this data is being used, so do please get in touch. More information about using the data and contact details are available via UCL Discovery (use link above). The final piece of the jigsaw is now in place. The XML dataset joins the transcriptions and digitally enhanced images available here on the Great Parchment Book website, and the free software and main academic outputs, including the complete overview of the project published in Oxford University Press’s Digital Scholarship in the Humanities journal. 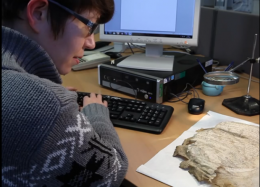 Together these provide full and publicly accessible documentation of this significant 17th century source for the history of the Plantation recognised by UNESCO, and of the project (conservation, transcription and digital reconstruction)which not only made it accessible to researchers for the first time in 200 years, but has provided a digital reconstruction solution for similarly fire-damaged historic parchment.